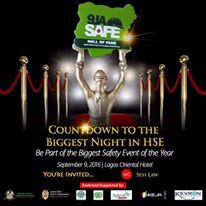 9JA SAFE (Hall of Fame) present COUNTDOWN TO THE BIGGEST NIGHT IN HEALTH & SAFETY (HSE) which will be held on the 9th of September, 2016 at Lagos Oriental Hotel, Lagos. You are invited! The event will be anchored by our very own comedian ‘SEYI LAW’. Be part of the biggest safety event of the year. You can’t afford to miss this year special event, also don’t forget to invite your loved ones. A.S.S.E, Hybrid Group, Ikeja City Wall and Autotainment Tv.